Provide comfort for the family of Greta Adams with a meaningful gesture of sympathy. Greta Adams was born in Morristown, NJ in 1917. For nearly 102 years she played a vital roll in her large family and among her many friends. Although she never married, she was never lonely. She always remembered birthdays. She cared for those who fell ill. She took part in special celebrations such as holiday parties, family reunions and summer vacations at Mattapoisett, MA. As often as time and geography made possible, she relished the fun and festivities around her. 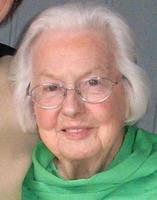 Following a brief illness, she died at Jefferson House in Newington, CT on March 31, 2019. She will be missed by so many whose lives she influenced.In her early years, Greta and her four sisters helped their mother operate a cooperative bakery in Boonton, NJ. In 1943, she moved to Hartford and began a 39-year career with Pratt & Whitney. Greta retired in 1981 and moved in 1988 to First Church Village in Wethersfield where she served as president of the social club, kept the resident garden growing until recently, and played weekly bridge, among other activities. In addition to her work life, she was always active in her community. She became a professional volunteer at Hartford Hospital, where she served for more than 70 years. She was also active with the Arthritis Foundation of CT and numerous other charities. Her avocations included playing the organ, water color painting, tai chi, gardening and most recently, monitoring online her family's goat farm in Maine where she tracked the birth and daily antics of 50 newborn goats each Spring.She is predeceased by her parents, four sisters and their spouses. She is survived by numerous nieces, nephews, grand nieces and grand nephews. Burial services are private. To extend online condolences or for further information, please visit FarleySullivan.com. To send flowers in memory of Greta M. Adams, please visit our Heartfelt Sympathies Store. We encourage you to share your most beloved memories of Greta here, so that the family and other loved ones can always see it. You can upload cherished photographs, or share your favorite stories, and can even comment on those shared by others. Provide comfort for the family of Greta M. Adams by sending flowers. My sincere condolences to the family. May the words at Psalms 94:19 comfort you at this difficult time.